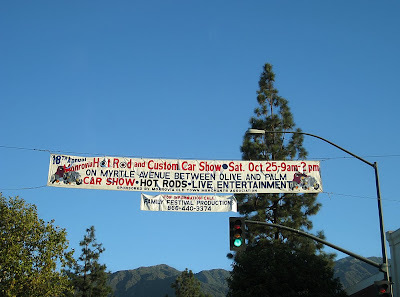 This Saturday, October 25th, from 9am to 2 pm on Myrtle Ave in Old Town Monrovia. Here's a photo from last years show. Do you expect Jay Leno to show up? Looks like a lively event. Too much for my sleepy town. Palm A: I have my doubts. He probably already has one of everything in his own garage. Babooshka: It's fun. A lot of reminiscing. I ask about Leno because he shows up at the Horseless Carrige Club Christmas meet every year. Palm: I'd never heard of the Horseless Carriage Club before. Interesting. I doubt the Monrovia event is unique enough to get a visit from Leno.